How do man-made satellites/space stations survive the hazards of LEO (low earth orbit) ? "In the 2009 European Air and Space Conference, University of Southampton, UK researcher, Hugh Lewis predicted that the threat from space debris would rise 50 percent in the coming decade and quadruple in the next 50 years. Currently more than 13,000 close calls are tracked weekly." "A report in 2011 by the National Research Council in the USA warned NASA that the amount of space debris orbiting the Earth was at critical level. Some computer models revealed that the amount of space debris "has reached a tipping point, with enough currently in orbit to continually collide and create even more debris, raising the risk of spacecraft failures". The report has called for international regulations to limit debris and research into disposing of the debris." "The great majority of debris consists of smaller objects, 1 centimetre (0.39 in) or less. The mid-2009 update to the NASA debris FAQ places the number of large debris items over 10 centimetres (3.9 in) at 19,000, between 1 and 10 centimetres (3.9 in) approximately 500,000, and that debris items smaller than 1 centimetre (0.39 in) exceeds tens of millions." "Russian and US satellites collide"
On 12 January 2001, a Star 48 Payload Assist Module (PAM-D) rocket upper stage re-entered the atmosphere after a "catastrophic orbital decay".The PAM-D stage crashed in the sparsely populated Saudi Arabian desert. It was positively identified as the upper-stage rocket for NAVSTAR 32, a GPS satellite launched in 1993. Your average Los Angeles fender bender typically shows more damage than this crashed "space object." Is the guy in the white robe and turban paying his respects, with his oh-so-properly bowed head, to something that has died? Maybe he knows that his little psyop has been 'outed'. What's up with the different angles of the shadows? Nice white outline around the fake object's 'shadow'. It looks very like a driveshaft gaiter, somewhat scaled-up in size. A very obliging desert sand cushioned it's fall leaving not a mark. The spacecraft will be the target of a future hypervelocity impact experiment to examine the physical characteristics of debris created when two satellites collide. Data gleaned from demolishing DebriSat will be valuable in the short- and long-term, said J. C. Liou of NASA's Orbital Debris Program Office. "Collision fragments are expected to dominate the future orbital debris environment," Liou told SPACE.com. Therefore, he said, a high fidelity breakup model describing the outcome of a satellite collision — in terms of the fragment size, mass, area-to-mass ratio, shape, and composition distributions — is needed for reliable short- and long-term impact risk assessments. Those appraisals deal with debris as small as 1 millimeter for critical space assets and for good orbital debris environment definition, Liou said. Some of the distributions for "large" fragments can be obtained from the U.S. Space Surveillance Network (SSN) observations. But the SSN data are limited to 10-centimeter (4 inches) and larger objects. "Laboratory-based experiments are necessary to collect data for smaller debris," he said. With the exception of software, all other aspects of the satellite's design, fabrication, and assembly integration and testing will be as rigorous as that of an actual flight vehicle, according to officials involved in the DebriSat effort. As a modern satellite target, obliterating DebriSat is expected to improve the NASA standard satellite breakup model. Once busted up, how much work is involved in piecing together just how the satellite reacted to the impact? "We are not actually gluing the satellite back together," Fitz-Coy said. "Rather we are characterizing — size, shape, etc. — of the fragments resulting from the impact. This is a labor intensive exercise. [FMB - And a meaningless one.]" I doubt we'll see much trustworthy stuff from this project. The U.S. military is launching a far-out neighborhood watch. But instead of warding off burglars, these amateur watchdogs are tracking orbital debris and possible satellite collisions in Earth orbit. The sky-monitoring project, called SpaceView, is a Defense Advanced Research Projects Agency (DARPA) program that enrolls the talents of amateur astronomers to help protect American space assets from orbital trash. The vision behind the DARPA SpaceView program is to provide more diverse data to the Space Surveillance Network, a U.S. Air Force program charged with cataloguing and observing space junk and debris to identify potential near-term collisions. NASA estimates more than 500,000 pieces of hazardous space debris orbit the Earth, threatening satellites that support peacekeeping and combat missions. These dangerous objects include spent rocket stages, defunct satellites and fragments from other spacecraft that are the result of erosion, explosion and collision, according to a DARPA statement. A collision between one of these small pieces of debris and a satellite could release more than 20,000 times the energy of a head-on automobile collision at 65 mph (105 kph), the statement adds. It’s a mess in orbit, and SpaceView officials are actively seeking information from individual amateur astronomers about their equipment, sites and observing habits to help keep a trained eye on this untidy state of affairs. I have been researching GPS and how satellites are said to make use of general relativity to pinpoint locations. Atomic clocks evidently run slower in higher orbits and using special calculations thanks to Einstein, these time differentials can be taken into account and compensated for and millions of cell phone users can be tracked within inches. Quite a feat for 24 satellites. Not to mention the fact that I am highly suspicious of relativity theory and its potential for being a cover for the atomic bomb. But if, in fact these satellites are orbiting the earth in a way that allows them to maintain specific distances from each other and are carrying computers on board that are capable of performing calculations that triangulate between themselves and millions, or billions of cell phones, without ever needing processor or RAM upgrades evidently, and taking into account that the power requirements for these calculations remains constant over time, how is it possible that they have the transmitting power to cover 22,000 miles 24/7? My experience with radio and television transmission is that it takes a fair amount of power to cover a few miles. I have yet to find the specific power requirements for broadcasting signal locally, but the idea of running a network broadcasting system that covers a radius of only even a few miles on solar power seems ludicrous. If the power requirements were met, what type of transmitter is capable of reliably pushing out the location data signal 22,000 miles? What frequency range are they using and why can we not get TV or radio more than a hundred miles out? Short wave can travel several thousand miles, but 22,000? All this precise real time location calculations done at great altitudes and incredible speeds and the satellites never need correction. Granted, I am not quite up to grasping the theory behind the calculations, but I am having a hard time believing that all these things are done remotely without the need for physical, hands on maintenance and adjustments. Plus, I can not find a photo of one of these things. Power, RF gurus, want to weigh in? Wasn't sure where to post this but evidently, the satellite "Suomi" is able to take high quality imagery, even on the dark side of Earth. Its ability to detect light sources is clearly remarkable. Why, then, can we see no stars? 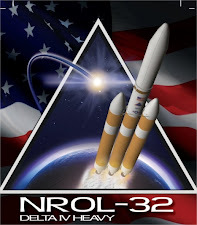 I couldn't find any discussion on the forum regarding the launch of the reconnaissance satellite NROL-32 back on November 21, 2010, so I am posting this. In fact, there is plenty of image/video material on the internet, and it is rife with symbolism. USA-223, known before launch as NRO Launch 32 (NRO L-32), is an American reconnaissance satellite which was launched in 2010. It is operated by the United States National Reconnaissance Office. Whilst details of its mission are officially classified, amateur observers have identified USA-223 as the fifth Mentor satellite. Mentor spacecraft are used for electronic signals intelligence, and carry large antennas to enable them to intercept radio transmissions. These antennas are believed to have a diameter of around 100 metres (330 ft). Bruce A. Carlson, the director of the NRO, described the spacecraft as being the largest satellite ever launched. USA-223 was launched by United Launch Alliance, aboard a Delta IV Heavy carrier rocket flying from Space Launch Complex 37B at the Cape Canaveral Air Force Station. The launch occurred at 22:58 UTC on 21 November 2010. Following liftoff the rocket flew East towards a geosynchronous orbit. By 23:05 UTC, official updates on the status of the launch had been discontinued. And here is a video by a cool guy who overflew the launch pad a few minutes before launch . Luckily, no one shot him down so he was able to cook some delicious tacos after he got home! Regarding GPS, mobile phones and the internet, I find the dates the most interesting. By December 1993, GPS achieved initial operational capability (IOC), indicating a full constellation (24 satellites) was available and providing the Standard Positioning Service (SPS). Full Operational Capability (FOC) was declared by Air Force Space Command (AFSPC) in April 1995, signifying full availability of the military's secure Precise Positioning Service (PPS). GPS was created and realized by the U.S. Department of Defense (DoD) and was originally run with 24 satellites. It became fully operational in 1994. The Global Positioning System became fully operational on April 27, 1995. Prior to that date, the long and complex process of launching and synchronizing satellites had been going on for years. Since the mid-1990s, GPS usage has spread widely and today millions of people use GPS navigation devices in their cars, aircraft, boats, or for any number of outdoor activities. The first machine-generated SMS message was sent in the UK on 3 December 1992 followed in 1993 by the first person-to-person SMS sent in Finland. Orange had almost national coverage, excepting Wales, when it launched on 28 April 1994. LowCall offered lower handset prices, but higher call chargers to less frequent users. In the Autumn of 1993 they launched MetroDigital as a direct competitor to Mercury's struggling One2One service. On 6 August 1991, the World Wide Web went live to the world. And it wasn't until 94/95 that the internet really became available and took off. Each GPS satellite transmits two carrier signals in the microwave range, designated as L1 and L2 (frequencies located in the L-Band between 1000 and 2000 MHz). Civil GPS receivers use the L1 frequency with 1575.42 MHz (wavelength 19.05 cm). The L1 frequency carries the navigation data as well as the SPS code (standard positioning code). The L2 frequency (1227.60 MHz, wavelength 24.45 cm) only carries the P code and is only used by receivers which are designed for PPS (precision positioning code). Mostly this can be found in military receivers. In the U.S., the analog AMPS standard that used the cellular band (800 MHz) was replaced by a number of digital systems. Initially, systems based upon the AMPS mobile phone model were popular, including IS-95 (often known as "CDMA", the air interface technology it uses) and IS-136 (often known as D-AMPS, Digital AMPS, or "TDMA", the air interface technology it uses). Eventually, IS-136 on these frequencies was replaced by most operators with GSM. GSM had already been running for some time on US PCS (1,900 MHz) frequencies. And, some NMT-450 analog networks have been replaced with digital networks using the same frequency. In Russia and some other countries, local carriers received licenses for 450 MHz frequency to provide CDMA mobile coverage area. The first of those components is hardware. That includes everything from the cables that carry terabits of information every second to the computer sitting in front of you. Other types of hardware that support the Internet include routers, servers, cell phone towers, satellites, radios, smartphones and other devices. All these devices together create the network of networks. So all technologies were initially tested in 1991 and then developed in 1993 and went full commercial by 1995. Both GPS and mobile phones use frequencies between 850 (old system) to 1900/2000 MHz. The internet uses cellphone towers. Sky waves, on the other hand, suffer most of their absorption losses because of conditions in the ionosphere. Note that some absorption of sky waves may also occur at lower atmospheric levels because of the presence of water and water vapor. However, this becomes important only at frequencies above 10,000 megahertz. They bounce the signal off the ionosphere! Also known as the Kármán line. There's more in my next post. So much for satellites. All these three technologies use the cellphone tower network for their operation and bounce the signal near the speed of light off the ionosphere. Case closed. Now we know why they have chosen those low microwave frequencies that fry our brain. They are the only ones which bounce off the ionosphere without delays and allow the gps devices and phones to not need antennae! We must live in an absolute sea of brain-frying low microwave radiation. Last edited by totalrecall on Wed Jan 09, 2013 12:25 am, edited 3 times in total. Amateur radio enthusiasts primarily use this quality of the ionosphere to help propagate lower frequency HF signals around the world: the waves are trapped, bouncing around in the upper layers of the ionosphere until they are refracted down at another point on the Earth. This is called skywave transmission. UHF TV signals are not carried along the ionosphere but can be reflected off of the charged particles down at another point on Earth in order to reach farther than the typical line-of-sight transmission distances; this is the skip distance. UHF transmission and reception are enhanced or degraded by tropospheric ducting as the atmosphere warms and cools throughout the day. And guess which frequencies lie in the 300 to 3000 Mhz range? Yep – GPS and mobile phones. The highly diluted gas in this layer can reach 2,500 °C (4,530 °F) during the day. Even though the temperature is so high, one would not feel warm in the thermosphere, because it is so near vacuum that there is not enough contact with the few atoms of gas to transfer much heat. The energy production efficiency of solar panels drops when the panel reaches hot temperatures. A field experiment in the United Kingdom revealed a drop of 1.1% of peak output for every increase in degrees Celsius of a home photovoltaic solar panel once the panel reached 42 degrees Celsius, or about 107 degrees Fahrenheit. The thermosphere is in the ionosphere. Oops. Maybe Nasa have super heat resistant solar panels? Spacecraft operating in the inner solar system usually rely on the use of photovoltaic solar panels to derive electricity from sunlight. So much for satellites. They are a lie. My guess is that for GPS, the GPS device shoots the microwave directly upwards where it hits the ionosphere. Most of the wave probably passes through at this angle and/or refracted and reflected elsewhere, but enough of a signal, although weak, comes down exactly vertically again. This signal is strong enough to be picked up by the GPS device and so it can tell you where you are. As it is directly up, and no two people/cars/boats/planes can be in the same position at the same time, there is no interference. For mobiles, they use lots of localized base stations on land probably due to the issue of potential interference from so many channels. They would use either skip distance from the the sender's nearest base station to the nearest base station of the recipient or preferably according to this website they use underground cables, if available. Calls are generally routed to a land-based T3 line laid underground in order to reach their destinations, but sometimes back up to a wireless antenna signal if the ground connection is poor (or nonexistent). These wired connections are more solid and trustworthy, which is why they are the preferred method of transmission. These fiber optic cables carry DWDM (http://en.wikipedia.org/wiki/Wav...) laser signals ( TCP/IP packets etc. ) at a rate of terabytes per second. They use optical repeaters to strengthen the signal which attenuates over long distances. These are powered by copper cables shown above.They have a decade lifespan and costs vary (depending on the length of the cable). Typical costs for projects are anywhere from US$ 100 Million to $500 Million. Do private telecommunications companies own the undersea cables that connect the internet across continents? Yes, the cables are owned by the various PTT or Transit carriers who would be utilizing (tapping) into the cable system. These companies are referred to as the O&M (Operations and Maintenance) companies of the cable system. Read the whole article in the link above as it even shows you a map!!!! We don't use satellites because they can't carry terabytes of data for less than a billion dollars per communication line. So neither GPS, nor mobile phones, nor the internet use satellites. The last conundrum remains as to what those lights are that traverse the sky at night once in a very infrequent blue moon. Could it be the space shuttle? I've no idea. Good observations TR and I’m very pleased that somebody else has picked up on the basic issue of heat! It really is the one and only physical reality that needs to be understood to wipe the mind clean of all, so called ‘space travel’.